The souls of the righteous are in the hand of God, and no torment will ever touch them. In the eyes of the foolish they seemed to have died, and their departure was thought to be a disaster, and their going from us to be their destruction; but they are at peace. The Eucharist looks forward to our participation in the heavenly banquet, where we are united with Jesus, the saints, and all those who share eternal life. Jesus said, “whoever eats my flesh and drinks my blood shall live forever.” (John 6:54) The Eucharist is truly the central point in a Catholic funeral. Its effectiveness is greatly enhanced when the family participates in appropriate ways: clothing the casket with the pall, selecting the Scripture readings, serving as lectors or extraordinary ministers, singing the responses and the hymns and, most especially, receiving Holy Communion. To have a representative of the Shrine present at this final moment is a great source of consolation to those who will now have to continue their journey in life without their beloved. 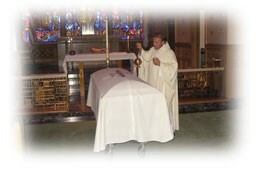 While a priest may be unable to preside at the Committal Service, a deacon or a trained bereavement minister may represent the Church at this final moment. 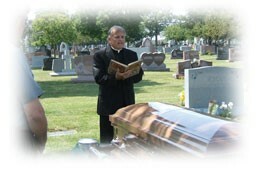 – If the funeral mass is of present body the family has to be contacted with the funeral home. The funeral home will be responsible for the procedures required for the celebration to take place. – If the celebration will be with the Ashes, the family must go to the office to make the registration. – The family or funeral home is responsible for acquiring a choir for the celebration. – The days for the masses are Monday to Friday. For funeral arrangements and other resources to the family, please contact the Shrine office at 847-294-1806. May God and Our Lady of Guadalupe bless you and your family.